BRIGHTON, Mich. April 25, 2012 – The service technicians at Brighton Ford Quick Lane take great pride in the quality of their work. Whether you need a quick oil change or major parts replacement these are definitely the technicians you want handling your vehicle. One of the services offered at Brighton Ford Quick Lane is the multi-point inspection. We went back to the Quick Lane service center to talk with the shop foreman, Mike Radloff, to show us what a multi-point inspection entails. Mike took us back to the shop where one of the service technicians, Josh, was in the middle of performing an inspection. Josh had one of the tires off and was inspecting the brakes using state approved measuring equipment. The brakes were in the green so Josh then measured the tires tread depth and inspected it for damage and uneven wear patterns. After measuring tread depth Mike had Josh show us how the techs inspect the suspension. Some of the elements he was inspecting were tie rod, wheel bearing, and ball joint endplay. As he shook the wheel he carefully listened for any unusual noises such as a “clunk” or “pop.” No sounds to be heard, the wheel is good and tight. Most people don’t get a chance to really see the underside of their vehicle so it was really cool to have a chance to safely walk underneath and get an up close and personal look at some of the vehicles elements you normally don’t get to see. The multi-point inspection consists of 150 different points of inspection. Not only is the multi-point inspection offered as a service but every used vehicle we buy goes through this inspection to ensure both the safety and quality of all the vehicles on our lot. 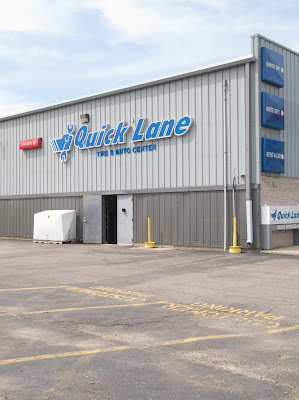 You can follow this link to schedule your next service appointment with Brighton Ford Quick Lane, and be sure to check out our coupon page to save yourself some money.